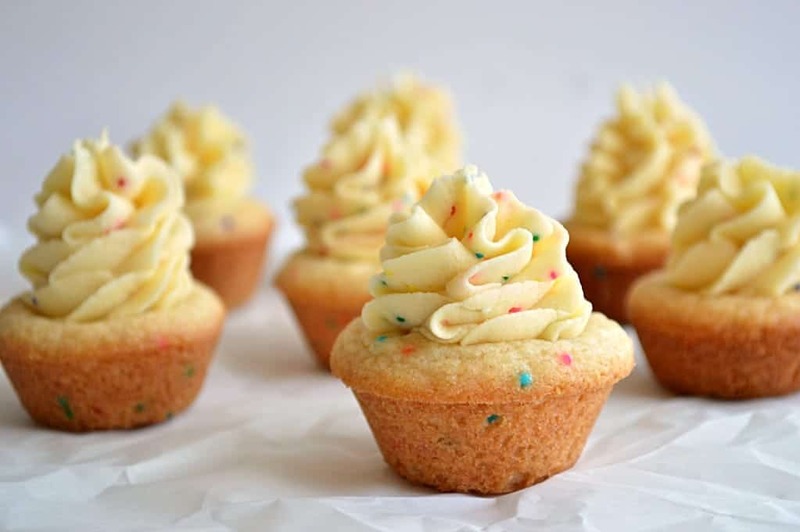 These funfetti sugar cookie cups are filled with cake batter flavored frosting! 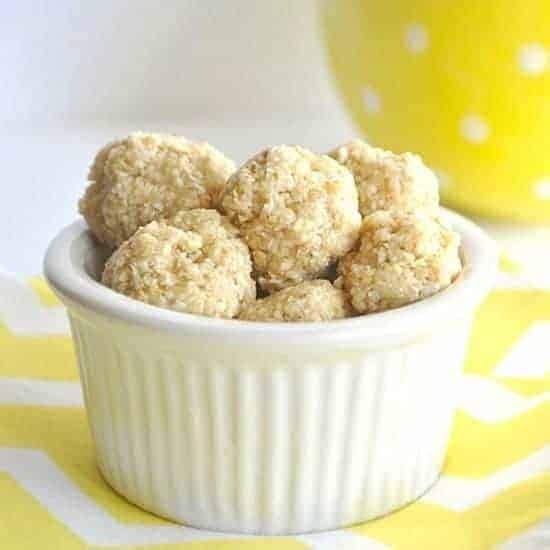 These bite sized treats are simple, easy, and taste so good they will knock your socks off! Happy Tuesday everyone! And a Happy late Memorial Day. 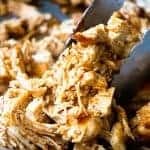 Hopefully everyone is recovering from too much BBQ,too much sun and too much FUN! What?! Can you have too much fun? One thing I know for sure you can’t have too much of though. Funfetti. Cake batter. Sprinkles. Okay, okay. That’s actually three things. 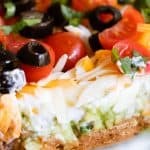 And this wonderful recipe combines them all in a delightful way. 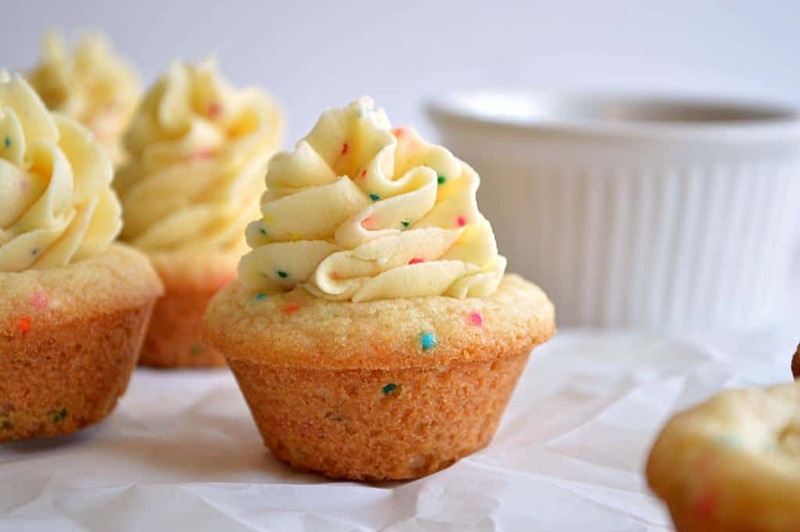 Funfetti sugar cookie cups. Again, made with a quick and easy sugar cookie mix, just like the Twix Sugar Cookie Cups, but this time I added 2 teaspoons of sprinkles to the batter before I cooked them so that they were fun and Funfetti-ish (yes, I just said Funfetti-ish). So then we have a base of funfetti sugar cookie. What could make those better?! Well, what makes anything better? Cake batter!! Of course, cake batter frosting. Why have I not made this sooner? When I thought of it I could feel my eyes go wide in wonder and excitement. The taste of it was everything I had hoped and dreamed it would be. 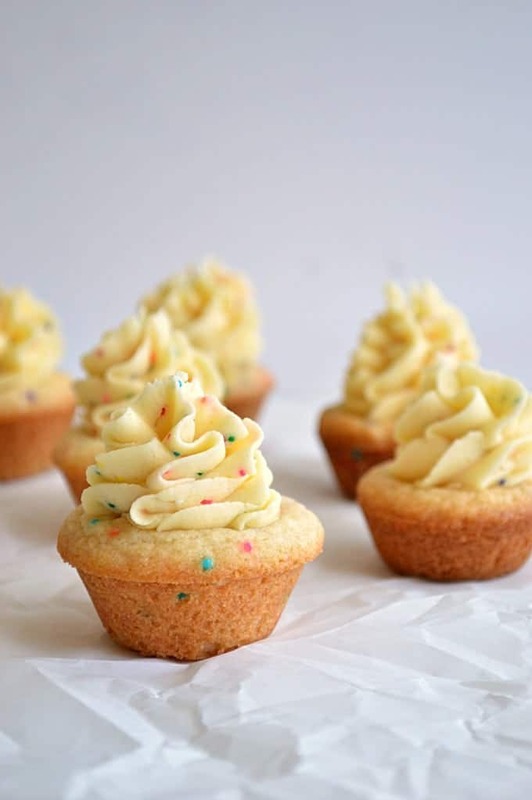 The pure essence of cake batter in the form of a frosting. The quintessence of cake batter. That’s right I said quintessence. For those of you saying to yourself “She probably just watched The Secret Life of Walter Mitty… no one uses that word…” You are absolutely correct!! Wasn’t that such a good movie!?! If you haven’t seen it yet, I recommend making some of these funfetti cookie cups and sitting down to watch it. You will not be disappointed; with the cookie cups or with the movie. 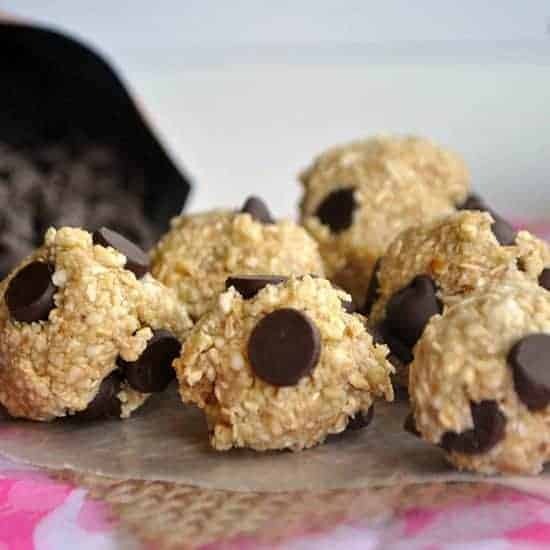 Don’t be intimidated to make these. All it takes is a mini muffin tin, make sure you spray it with some non-stick cooking spray. Once you have the dough, just roll it into little balls about 1 inch in diameter. Place the dough into the muffin tin and slightly press it down with your thumb making an indent in the center of the dough. This helps them to bake more evenly and quicker. I bake mine for about 9 minutes. When you remove them from the oven you will see that the indent has pretty much disappeared. I use my 1/4 teaspoon, since it’s perfectly round, and slightly press down on the top of the cookie cup again. 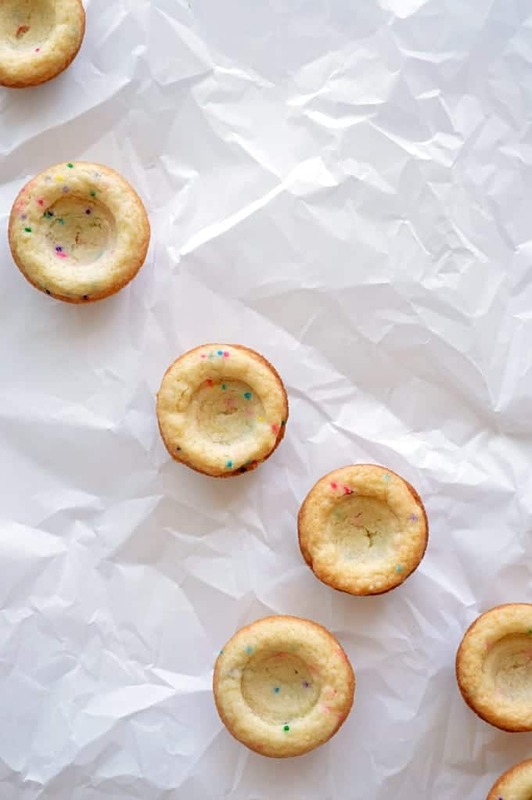 This creates the perfect size indent for the cookie cups. Allow them to cool in the pan for 5 minutes and then remove to finish cooling on a wire rack. 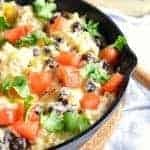 Add all ingredients into mixing bowl. Mix on low speed until all ingredients are combined and frosting is desired consistency. Add more powdered sugar or heavy cream as needed. It’s not even 7AM and I would love a plate of these. Probably not a nutritious breakfast but they look so good Serene! Matt, personally I think these would make a perfect breakfast! Hope you have a great day 🙂 Thanks for stopping by! You had me at funfetti! These cups look perfect and oh so happy! Too much sun? Probably 🙂 But sprinkles? No. You just can’t. 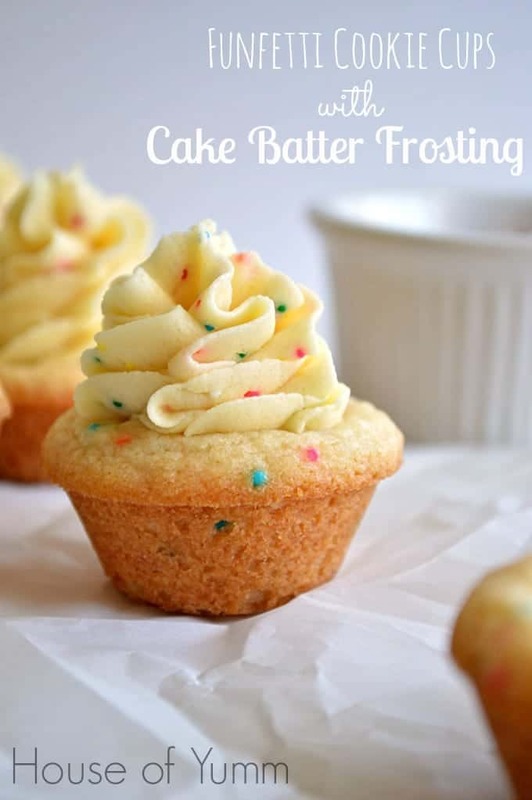 And not cake batter either … although I would not be able to avoid testing that with these around! These are genius, Serene! Glad you had a great Memorial Day weekend! 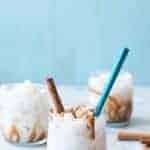 they look yummy and fun! Thank you so much Dina! Thanks so much Amy! And you’re right, you can never go wrong with funfetti! Hope you’ve had a great week! 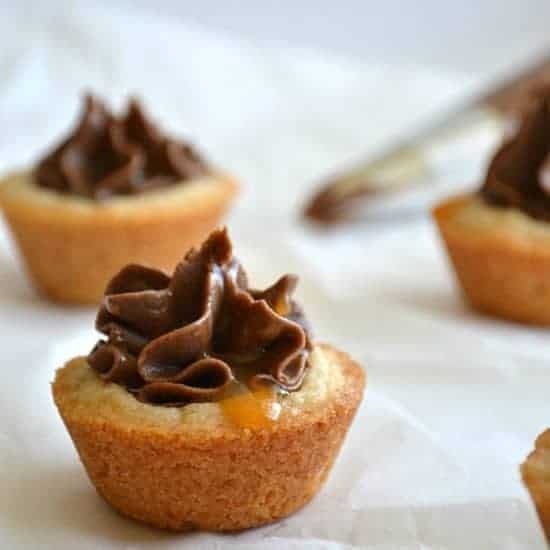 These cookie cups are so adorable! And of course they look delicious, too! Thank you so much Gayle! Hope you’ve been having an amazing week! And enjoy the weekend coming up! Serene, these look super cute… and delicious! Love the whole funfetti action on these! I made these for my Labor Day BBQ. They are delish I can’t wait to share them with everyone. They were so simple to put together. Thanks!! Making whoopie pies for thanksgiving and was looking for a tasty substitute for the traditional filling. This looks like a winner, can’t wait to try it! Hi Cadi! There is NO EGGS 🙂 I used cake mix but if you look at the recipe I prepared it without eggs so it is edible! 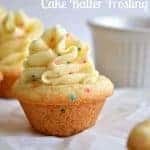 So this was my second attempt making cake batter frosting…the first time I tried to substitute Trader Joe’s vanilla cake mix for the regular store bought stuff as I am a bit of a health nut…this did not work at all so do not attempt! ! 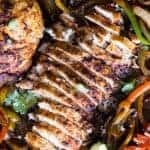 I followed this recipe and it worked perfectly!! I attempted to frost with piping tip however the frosting was a little too thick for the size I was using so i would recommend using an XL tip or add slightly more cream. 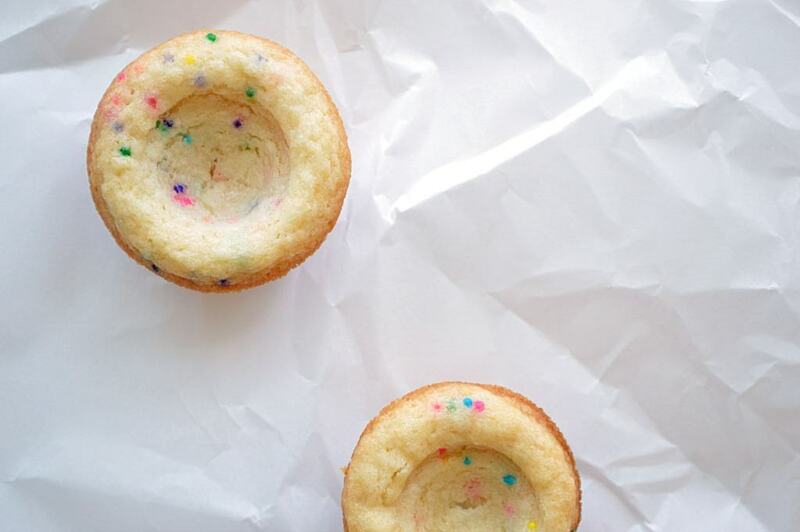 Also a flower tip doesn’t work if you stir in sprinkles to the batter …they just block the tip.